Hello everyone! 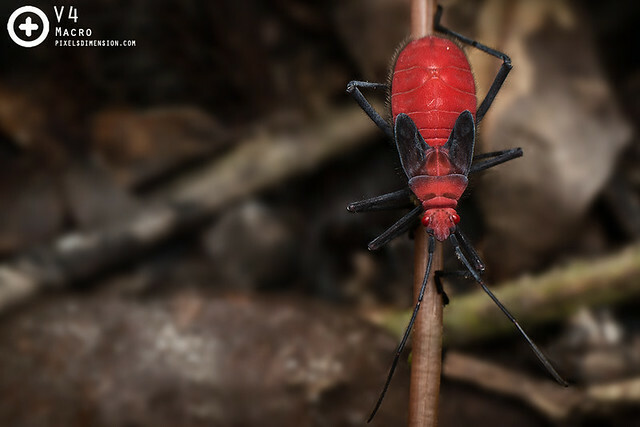 Looks like the rainy season is back here in Malaysia, the bugs are back, and so have I! I hope everyone is doing well out there! The long drought and haze in Malaysia (we almost had to endure another water rationing regime!) has left many of my Macro friends frustrated since finding bugs or any creature can be really hard during that time. Because of this, I’ve got quite a lot of questions recently on how to find specific creatures, eventually leading to today’s article. Nature is beautiful and filled with countless diversities of life. As a beginner in Macro Photography, just where should we start? This article will teach Macro Enthusiasts about some popular Macro Subjects, and of course, where to find them. Hopefully the information here will be able to lead you to your coveted subjects and further spark your interest in Macro Photography! However, please take note that Malaysia is a tropical country, thus the facts here only apply to similar regions ya. Also, considering the vast array of organisms out there, I will only be mentioning the popular ones. 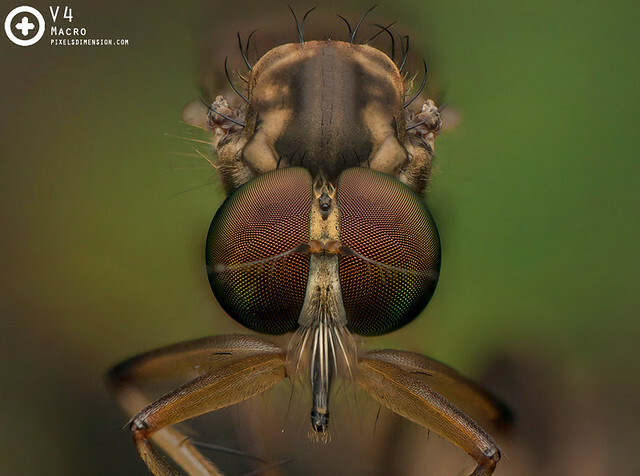 Robberflies are usually at the top of the wanted list of Macro Photographers! Cooperative and great-looking, its hard not to love them! If you are a Macro Enthusiast, robberflies (Asilidae) are definitely on your macro wishlist. Sporting two large, colourful eyes and extreme cooperativeness, these flies often perch on twigs and branches (especially fallen ones), waiting for prey to pass by. What’s more, they (depending on species) will almost always return to the same spots even after flying away as a result of disturbance. Robberflies are carnivores and feed mostly on flying insects. They are known to be able to catch and kill flying preys in-flight, which is extremely cool. 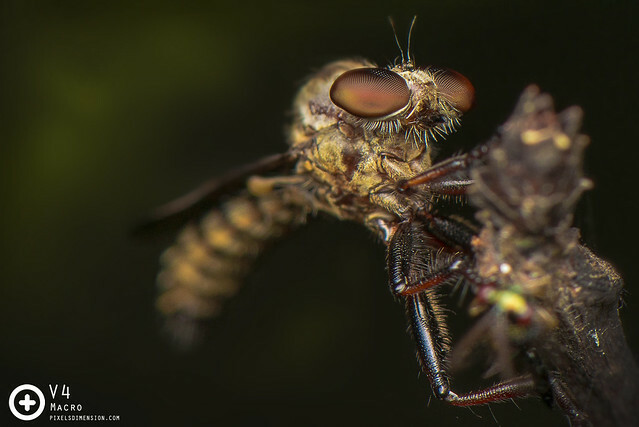 A Robberfly is capable of taking down a prey (even a fly so small in this photo) in mid-air. How awesome and precise is that? Why are Robberflies popular? Robberflies are always fascinating to photograph as they are photogenic plus there are many different species of them, each displaying different size, shape and colors of the eyes. 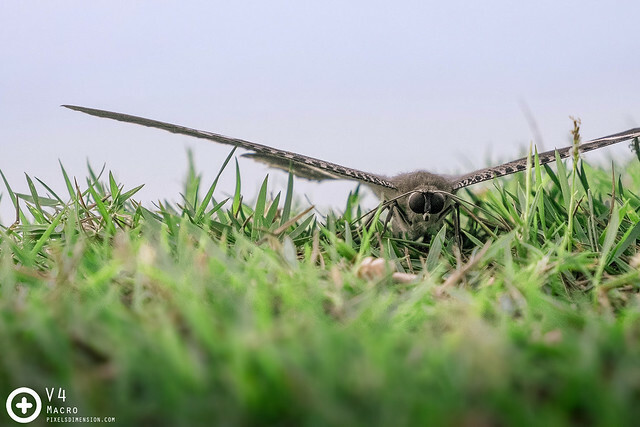 Robberflies are not easily scared off when you get close with your DSLR; even if they do fly off, they will return to the same spot after you back away. Also, the chance of you finding a Robberfly eating is high. Not all Robberflies are the same, some look a lot fancier than others! Of course, the fancier ones are usually harder to find and photograph. Where do I find one? Robberflies are active during the day and are quite common in cool, shaded areas of gardens, hills and forest parks. They are often found perching on the tips of fallen twigs and branches. Try looking for them at around 8am- 11am. Robberflies are easy to identify by their big and colourful eyes as well as their perching behavior. These flies are usually small (~1-1.5cm), though some wild species can be as big as 3-4cm in size, with dramatic colours. Wild species may not return to original spot after spooked. 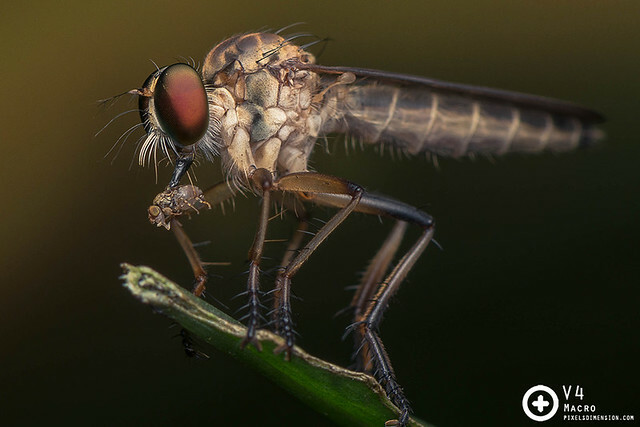 The eyes of a robberfly reflects light very effectively, and is often used as a “gauge” by Macro Photographers to see how well the light diffusion is on their Macro Gears. 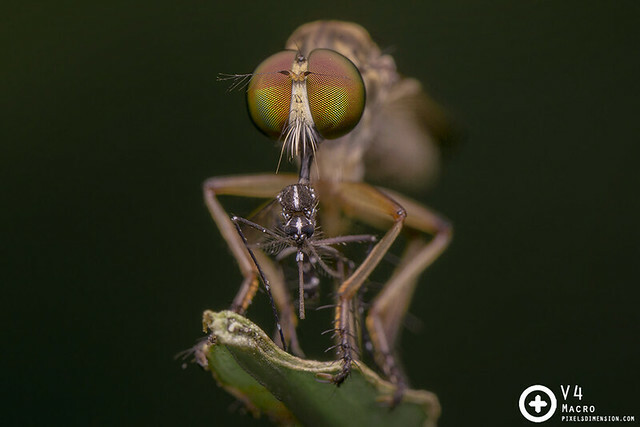 Robberfly eyes are indicators on the effectiveness of your Macro Flash system. It was after this shot that I realized that my flash diffusion system is still premature. Butterflies and moths (Lepidoptera) are some of the most common and beautiful creatures of the world. The trick to photographing these magnificent bugs (especially moths) is to find the really beautiful (and uninjured) ones, which are of course, rarer. Butterflies are likely the most beautiful insects of the world; because of that, they are likely amongst the most studied as well. It is simply amazing how an “ugly” caterpillar can change into something so stunningly gorgeous! Moths do not get as much attention as butterflies, mostly because they are not as strikingly coloured. Nevertheless, some of the largest moths out in the world can be very attractive. Both the butterfly and moth feed on nectar. Moths tend to be duller in terms of colour (usually in shades of brown to white), and will rest with their wings “opened”; whereas butterflies are in general more colourful and rest with the wings “closed”. Large-sized butterflies and moths can be rather fragile and are often found with damaged wings. 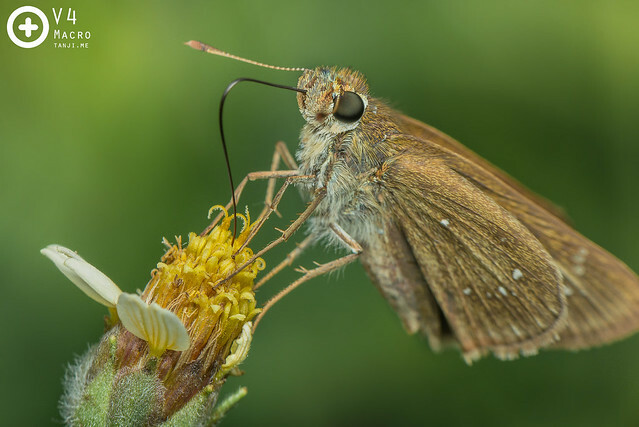 Butterflies often perch and make good subjects for Macro Photography. 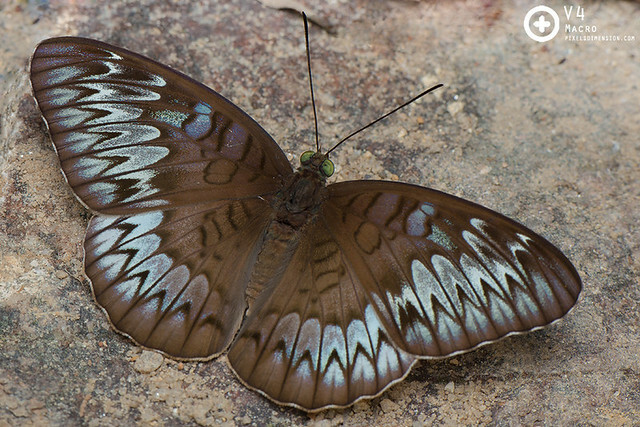 Many species of butterflies display awesome and colourful patterns on the wings too! Why are Butterflies and Moths popular? Butterflies are generally more popular than Moths due to their fancy colourings; after all, your Choice of Subject is important in Macro Photography (Previously covered in Taking Better Macro Shots- Choice Of Subject). However, some moths can grow very large and unique-looking, thus becoming a worthy subject. Many types of butterflies and moth show the tendency to perch, making them easy to photograph. Where do I find one? Butterflies can be easily found in gardens with flowering plants (Try 8-11am). Moths are usually more abundant in higher, cooler places, where they simply rest plants or even on walls of buildings (Available at any time). 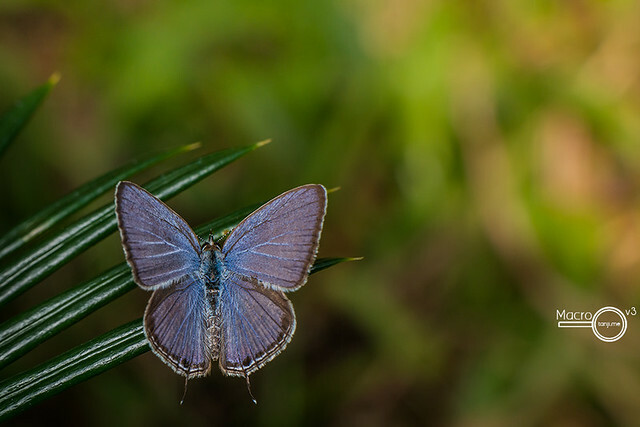 Butterflies with uninjured wings can usually be found in quieter places of parks, secondary forests etc. Of course, butterfly parks are great places to visit as well; that way you spend more time shooting rather than finding or chasing butterflies and moths! Where there are flowers (even very small ones like the Tridex in this photo), there will always be butterflies! Butterflies and moths are large and are thus suitable subjects especially for beginners shooting macro with natural light (i.e. not using flash). 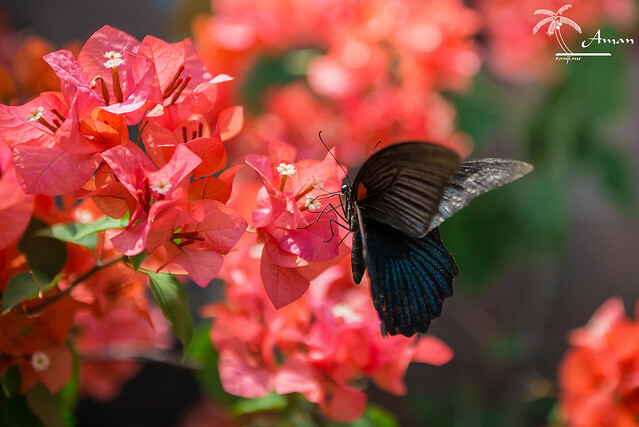 Since butterflies tend to hover around flowers while sipping nectar, they make great practice for in-flight shots. Butterflies hover momentarily when sucking nectar, making good subjects for in-flight shots. – Moths are often oblivious of its surroundings and will not flee, making them very good subjects for extreme macro shots. Jumping spiders (Salticidae) are merely a tiny group out of all the spiders out there. These spiders are treated like celebrities in the Macro World and it is not hard to understand why. 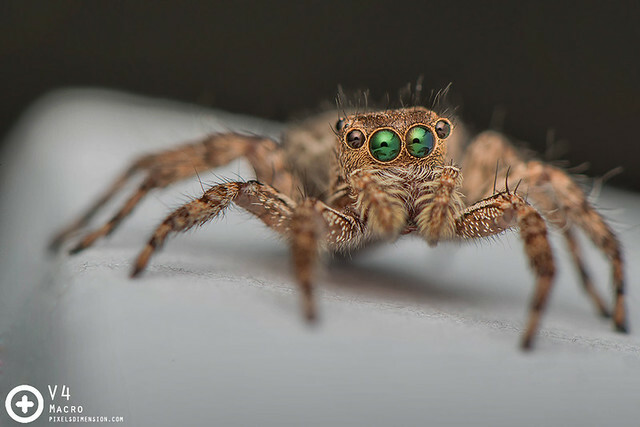 With their large, round and “sparkling” eyes, it is hard not to love these jumpers. What’s more, the small size means that these spiders are not as scary as their bigger brothers. 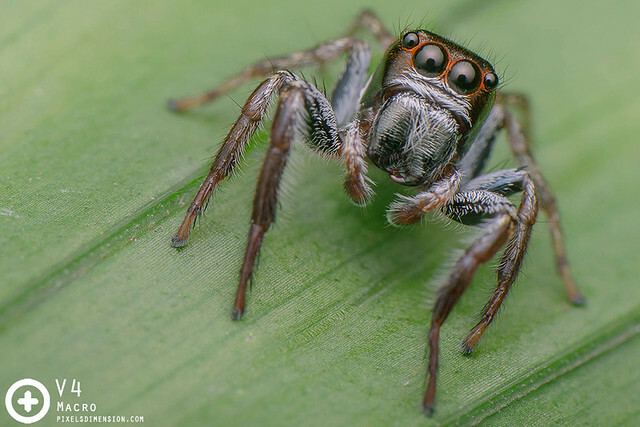 Jumping spiders are often the first subjects beginners love to photograph since they are ridiculously common, and they occur in a wide range of forms and colours, depending on genus and species. Although Jumping Spiders have eight eyes, its usually the largest two that attracts attention; and as you can see here, some may occur in different colours! 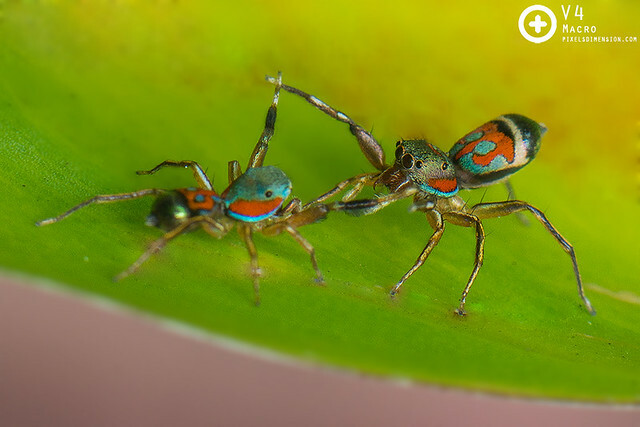 Why are Jumping Spiders popular?Jumping Spiders are common, tiny, cute and colourful. Certain species of jumping spiders are especially cooperative, some curious even (and will jump onto your camera!) The huge variety of these cute little creatures (even males and females look different from one another) means that searching and photographing them is always fun and refreshing. Where do I find one? Jumping Spiders are tiny (<1cm) and everywhere, but the most common ones are often found on buildings of walls (even in your house), tree trunks and low vegetation in your garden or your nearest parks. These spiders are more active during the day, and most enjoy the sun (Try 8-11am; 5-6pm), thus easy to find. 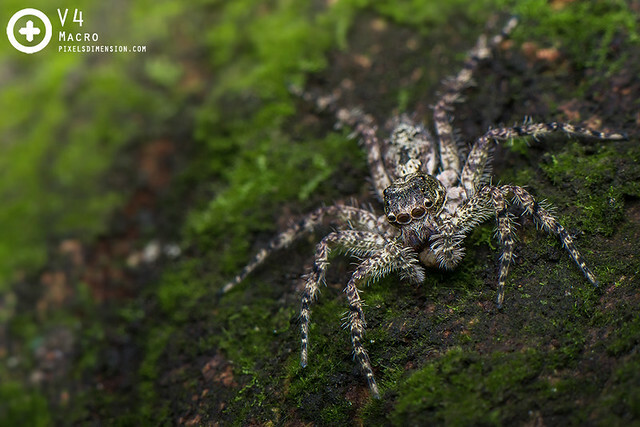 A beautiful Malayan Tree Trunk Jumper which, as the name suggests, can be found on tree trunks. Note how different tree-dwelling spiders are from normal ground ones. The big and rounded eyes of a jumping spider reflects light very well- a good method to design the shape of your Macro flash diffuser. More details on DIY flash diffusers here: 6 Things About DIY Flash Diffusion That You Should Know. Although difficult to capture, some jumping spiders display courtship “rituals” or “dances” which can be very captivating! Dragonflies may be large, fast carnivorous fliers; but they are very good macro subjects. Dragonflies leave their wings “opened” when in resting position, and has rounded eyes that “touch” one another at the top of the head. Damselflies are smaller, slower and weaker fliers compared to dragonflies, but they are equally beautiful and attractive. 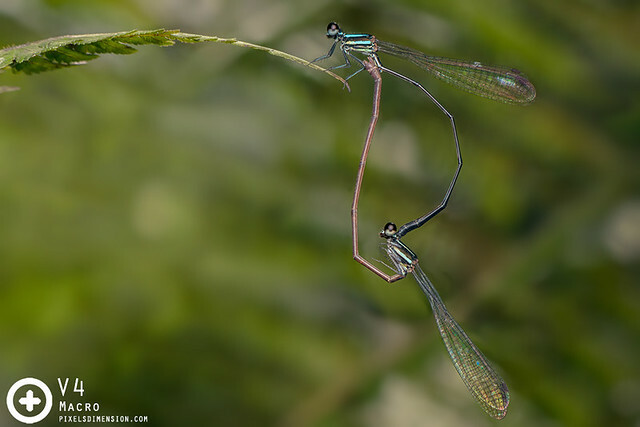 Damselflies “close” their wings when in resting position, and they have separated eyes that don’t touch one another. Dragonflies (Odonata) are predatory fliers since ancient times, and can be easily recognized by the two pair of wings and the long tail. Damselflies are smaller, slower versions of dragonflies, which “closes” their wings when in resting position. 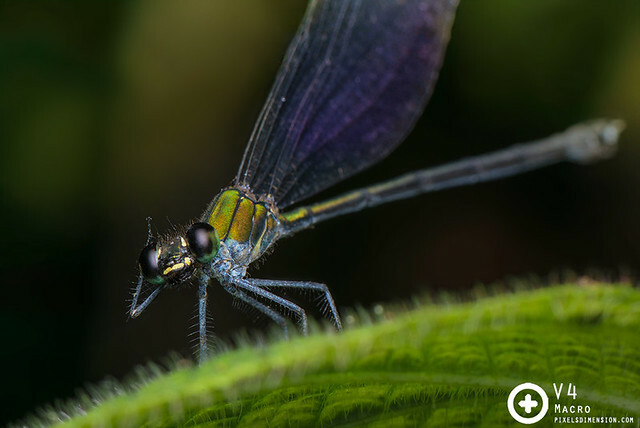 The eyes of damselflies are different from dragonflies as well, where they occur on the left and right of the head via stalks but never touching one another as in dragonflies. Most dragonflies and damselflies are active during the day, and can be found near streams. These insects tend to be territorial, and thus will return to the same perching spot even after being scared off. 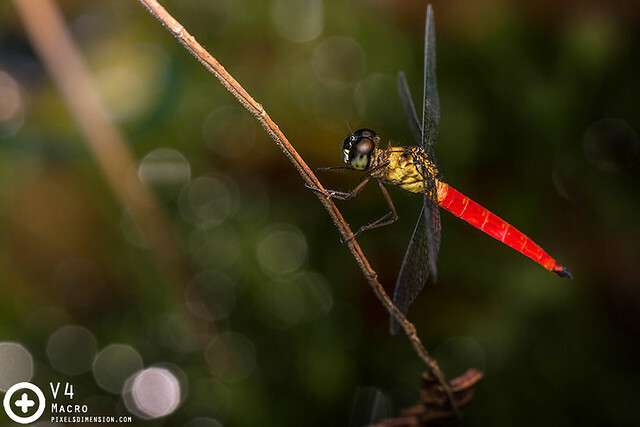 Dragonflies display territorial dominance, where the males with the largest territory will win over females. Because of that, dragonflies (and damselflies) will always return their original spots to stand guard. 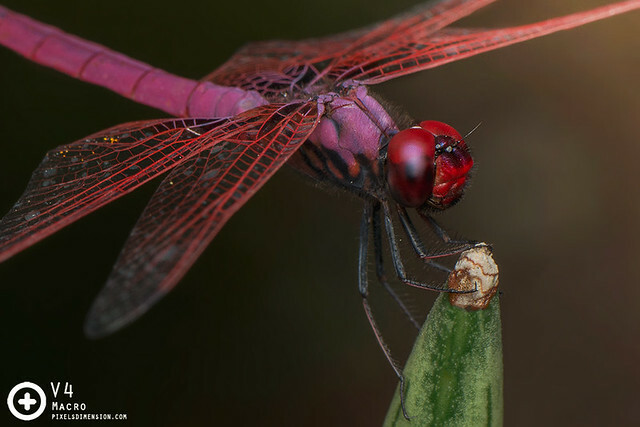 Why are Dragonflies and Damselflies popular? Dragonflies and damselflies are popular because they are common, and most tend to be cooperative and not fly away when you approach them. Many will return to the original spot even if spooked. The many different forms and colours of the dragonfly’s eyes and the damselfly’s body are worth appreciating. Where do I find one? Most dragonflies and damselflies dwell around streams, although the species you find may vary depending on the water current as well as the location. Dragonflies tend to come out when it is sunny (try 9am-5pm), where most will perch on twigs and rocks. Damselflies can be found perching on vegetation along the stream, and can be found any time. 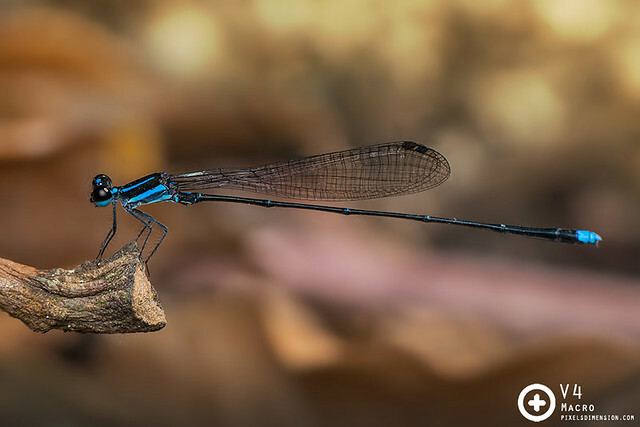 A magnificent Flashwing Damselfly can be as large as a typical dragonfly, but can only be found in quieter and shaded areas of streams. These insects display amazing courtship and mating behaviour, which can be challenging to photograph, but nevertheless a precious sight to behold. – Some dragonflies and damselflies show “predictable” flying patterns, thus good for practising in-flight shots. 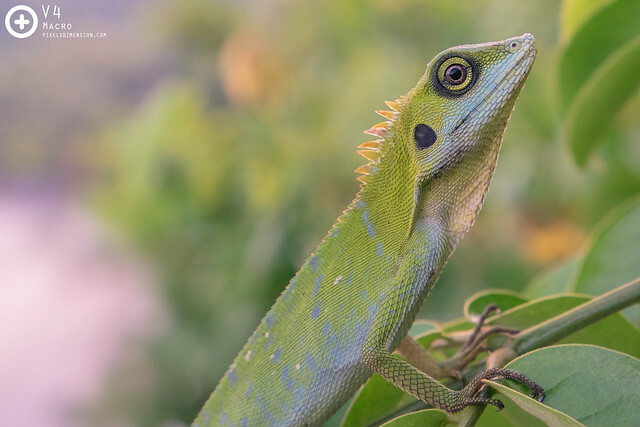 Lizards may not be small, but their unique appearances and colours make them wonderful creatures to capture as well! Most of us would classify anything (e.g. gecko, skink, salamander etc.) as a lizard, but in fact they are very much different from one another. 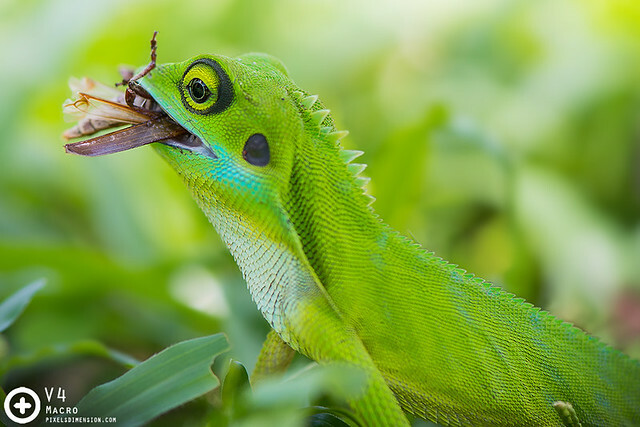 Lizards are large sized (<~60cm), scaly-looking and cold-blooded reptiles which are also a popular subject for Macro Photographers. These lizards are known to be able to change their body colours depending on “mood” as well as the surrounding. Most are colourful and attractive. Why are Lizards so popular? Lizards, at the right time, will remain very cooperative. The large size means it is easy to photograph it, even without using flash techniques or even a macro lens. Not to mention, these wonderful reptiles can alter body colour, giving you more photo variety per individual photographed. Where do I find one? Lizards are common and can be found in gardens, parks, mountains, forests, beaches etc. These reptiles, being cold-blooded, need to obtain energy from the sun before they become active and capable of going about with their lives. Thus the best chance is to look for them before they get enough sunlight (Try 7-10am). Most will bask in the sun on branches or tree trunks during this time and will remain relatively “dormant”. Lizards are cold-blooded animals and thus need to derive warmth from the sun. As a result they can be easily found basking in the sun. 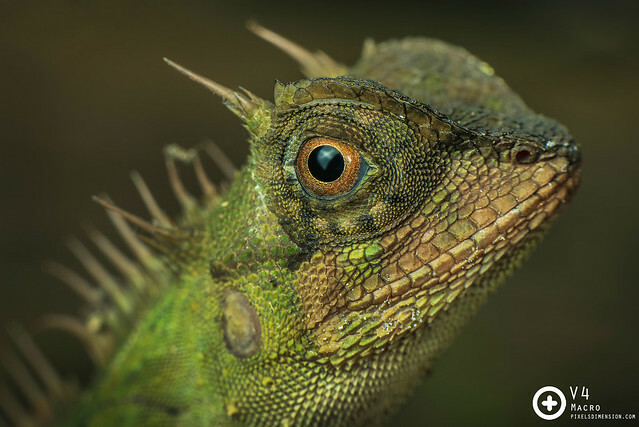 The eyes of lizards are very large, sophisticated and colourful, making it an interesting subject to photograph upclose. The reflective eyes also “gauge” the effectiveness of your flash diffuser’s shape. The claws of lizards can be very sharp, so avoid holding them. Getting a good subject is great, but your photography skills are equally important. For more details please read: Macro Photography- Taking Photos That People Like. 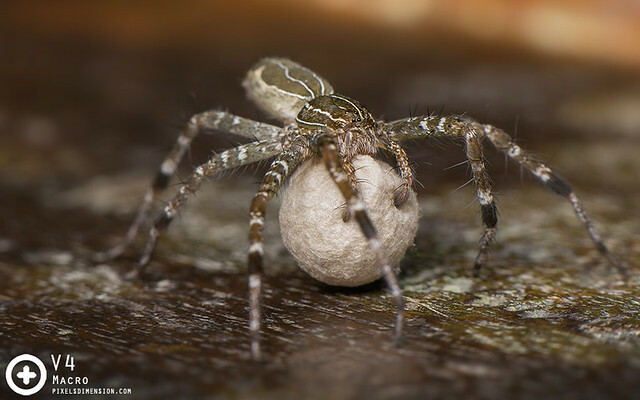 A mother Nursery Web Spider takes great care of her children. When only will we learn to care for them (and every other wildlife out there)? I hope that beginners in Macro Photography will find this article useful, and while you improve in macro skills, I hope you also understand more about your subjects (as covered here: Becoming A Better Macro Photographer- Knowing Your Subjects), and eventually learn to appreciate as well as caring for them. Thank you for reading, have a nice day and Happy Macro Shooting guys! ** Short-listed subjects are based on my own experience in Macro Photography, and I totally understand that some others may be overlooked. Will add in later if appropriate.